Raising children between two homes is a challenging task. And when families experience transitions, children especially need and deserve the love, care and support of both their parents. For this reason, The Parenting Center’s Co-Parenting program, Family Transitions, provides comprehensive support, education and guidance designed to help parents keep their children safe and happy throughout the transition. Our dynamic services are offered to parents, step-families, grandparents, and children and include classes, consultation and mediation. To register for upcoming classes, click on the classes tab for Co-Parenting courses. For more information about co-parenting classes please contact Esther Grabow at egrabow@theparentingcenter.org. • Co-Parenting Essentials: Designed to help prevent problems resulting from divorce and to keep children out of the middle of conflict. • Kids First: To help adults explore how children perceive divorce and litigation. Both classes uphold the basic concept of empowering family members to look at their situation from a more effective point of view, make better decisions and focus on the most important people in their lives: their children. Participants learn how to make better choices themselves, and also discover the various professional services that are available to them. 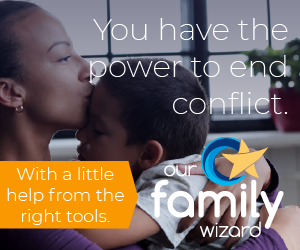 The Parenting Center encourages those in co-parenting relationships to use Our Family Wizard, an online communication platform. This tool allows the co-parenting parties to view private and shared family calendars that allow parents to record activities, trade days; post protected messages; and add notifications and reminders about important dates or plans. It also includes a family journal; an expense log; and an info bank to share health records, emergency contact information and much more. A subscription is $99 per parent per year. For every parent who uses this link, The Parenting Center will receive a share of the costs, allowing the agency to provide scholarships to clients who need financial assistance for these classes and services.